Which of the following is NOT a shaping feature supported by Cisco IOS? For traffic shaping, Cisco IOS QoS includes Generic Traffic Shaping (GTS),Class-Based Shaping, and Frame Relay Traffic Shaping (FRTS). These features allow you to regulate packet flow (that is, the flow of traffic) on your network. Brian Dennis and Brian McGahan, Co-Founders of Internetwork Expert, will make a major corporate announcement during an online webcast, Thursday, October 30th at 11AM PDT. Current customers please note, this announcement will not affect the status of our Investment Protection Program. All previous, current, and future purchases are still protected under this plan! I’ll tune in Thursday to see what the announcement is but based on the wording I am hopeful that this means that IE is going to launch Version 5 of the Routing and Switching Class On Demand. You are tasked with ensuring that all communications are stopped on this port if the spanning-tree protocol is detected on this port. ‘spanning-tree bpduguard enable’ under an interface will put the interface into error-disabled mode if a BPDU is received on that port. The portfast feature does not need to be configured on the interface. ‘spanning-tree portfast bpduguard default’ at the global level will affect all ports on your switch that have the ‘portfast’ feature enabled. Those ports will be shutdown if they receive a BPDU. In our question, ‘portfast’ is not enabled on the interface so we need to use ‘spanning-tree bpduguard enable’ under the interface. Which QoS service model requires that the application request a specific kind of service from the network via explicit signaling before sending data? When you see integrated service you should associate it with RSVP. Integrated service is a multiple service model that can accommodate multiple QoS requirements. In this model the application requests a specific kind of service from the network before it sends data. The request is made by explicit signaling; the application informs the network of its traffic profile and requests a particular kind of service that can encompass its bandwidth and delay requirements. The application is expected to send data only after it gets a confirmation from the network. It is also expected to send data that lies within its described traffic profile. The network performs admission control on the basis of information from the application and available network resources. It also commits to meeting the QoS requirements of the application as long as the traffic remains within the profile specifications. The network fulfills its commitment by maintaining per-flow state and then performing packet classification, policing, and intelligent queuing based on that state. Internetwork Expert is running second instance of their Real CCIE’s, Real People Scholarship between now and the end of the year. As part of Brian Dennis’ and Brian McGahan’s ongoing commitment to the CCIE community, Internetwork Expert is pleased to announce the Real CCIE’s, Real People 2008 Scholarship. Onsite Bootcamp of the recipients choice (including airfare, hotel, provisions, and ground transportation). All Applications Must Be Submitted By 11:59PM (PDT) Wednesday, December 31, 2008. All online information must be received by Wednesday, December 31, 2008. First-in, first-out (FIFO) queuing is an example of which QoS service model? While “best-effort service” should probably get a marketing makeover, it is considered a QoS service model. Best effort is a single service model in which an application sends data whenever it must, in any quantity, and without requesting permission or first informing the network. For best-effort service, the network delivers data if it can, without any assurance of reliability, delay bounds, or throughput. The Cisco IOS QoS feature that implements best-effort service is first-in, first-out (FIFO) queuing. Best-effort service is suitable for a wide range of networked applications such as general file transfers or e-mail. 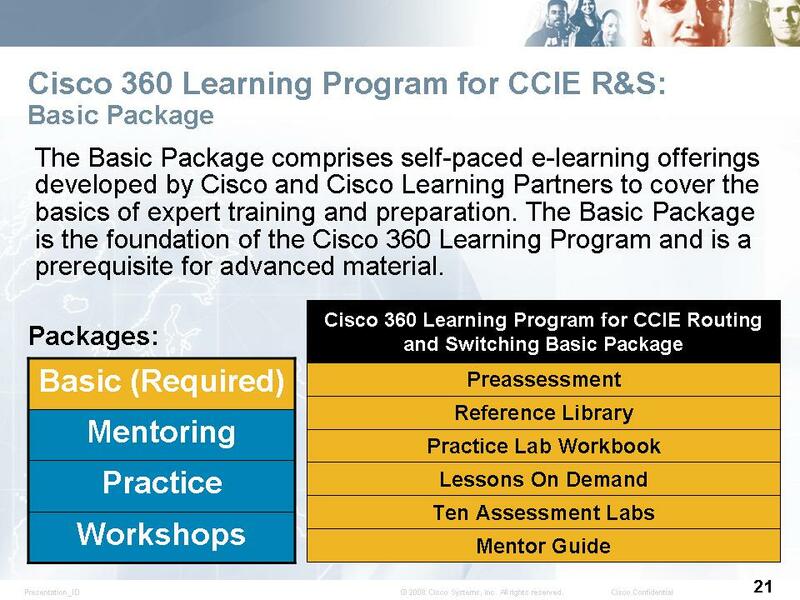 The big news of the last couple of weeks in the CCIE world has been the announcement of Cisco first official training program for the Routing and Switching CCIE track, the Cisco 360 Learning Program for CCIE Routing and Switching. I’ve posted about this a couple of times (here and here). Since that time more information has become available and NetMasterClass has even started selling the training. It looks like a rebranded version the NetMasterClass end-to-end training which will be offered by multiple Cisco Learning Partners (once they are certified by Cisco and at varied levels). NetMasterClass has a great reputation and the training is sure to be very solid. My opinion is that the major difference between the 360 program (other than Cisco’s seal of approval) is the Learning Management System that will serve as the training portal as well as track candidates’ progress. The biggest downside is the price as well as the lack of details about the online training portions. My opinion is that this training will be popular with candidates within Cisco, working for Cisco Partners, and those who receive financial backing from their employers. There was a competiton or bid of sorts between the major vendors. It seems NMC won the bid. Maybe others but we’ll see in a few days. As of now just NMC that I am aware of. The training program will be based on the NMC-1 Advanced CCIE 1-Week Class currently offered by NMC. The pre-assessments are similar to NMC’s per-technology quick exams – currently less than 15Q [questions]each as I recall – correct me it’s been a while since I tried one. The pre-assessment will be similar to the CCIE Accessor or the Day-1 Lab given by NMC on the first day of class. The online classes will likely mimick and/or mirror the NMC Video on Demand, which consequently in some cases are quite “exactly” similar to the NMC Tech Library which is quite “exactly” similar to the NMC-1 one-week CCIE Bootcamp. This material is nearly word-for-word verbatim to the class as I recall. The practice labs will likely be very much the CheckIT Labs with the CheckIT grading system. Anyone from back in the day who used Mentor Technologies VLabs will recall the format and layout. This jives somewhat with what I was told about the process of selecting a vendor(s) to participate in the program. These classes are ONLY offered through SKYLINE-ATS, Globalknowledge, Fast Lane and CTT and some of the SOs that are claiming that they can offer the class is incorrect, they have to go through their CLSP, and ONLY so many instructors are allowed to teach this class, and as of now there are 8 of them. 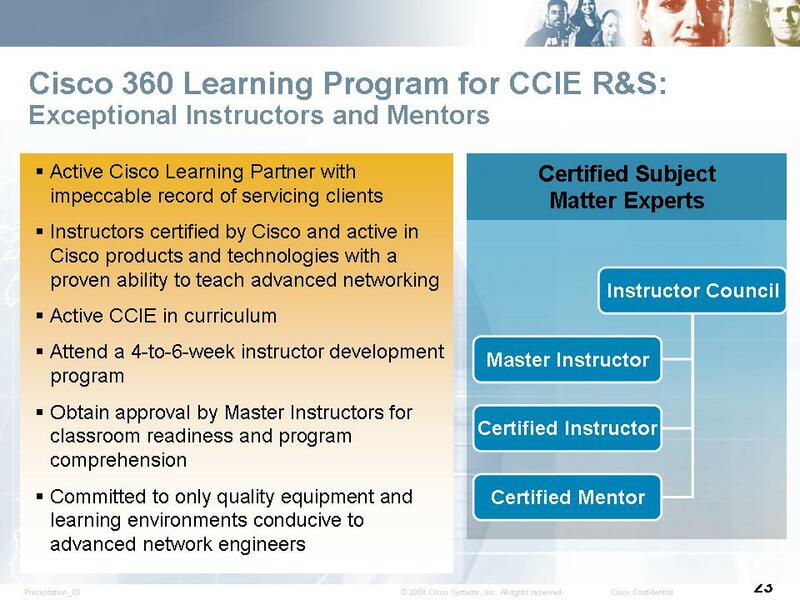 As you know, Cisco requires partners and instructors to meet very high standards in order to offer CCIE 360. To your list I would add Netmasterclass! For NMC Bruce Caslow, Val Pavlichenko, Bill Burns and myself are currently qualified by Cisco to teach CIERS1 and CIERS2. You are 100 percent correct, and You, Val and Bruce are certified to teach and from this group i believe Paul Borghese, Johnny Bass, Vasil and I are almost there. There was another gentleman that I forgot the name. It looks like a number of the top CCIE instructors are already getting trained to participate in this program. CCBootcamp and NetMasterClass (no surprise since they helped develop the course) look like they will be the first (and only?) 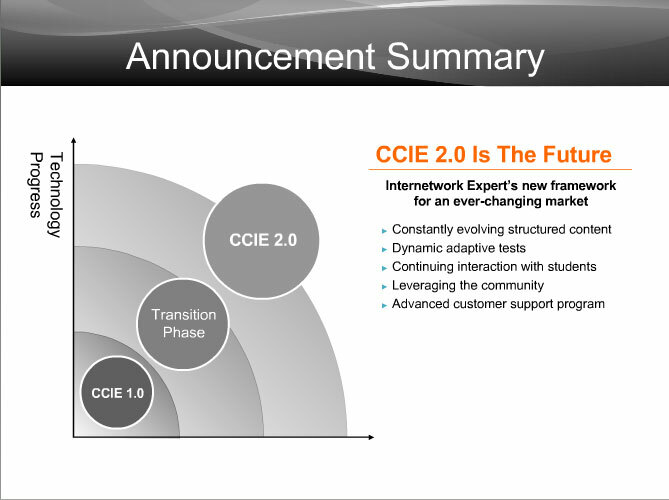 of the “core four” CCIE vendors to offer the 360 training program. Arden Packeer posted an excellent blog entry about this new program which gives nice look inside the Cisco training hierarchy and explains what the hell is a CLSP? Cisco delivers its official course material through its Learning Partner program. Cisco structures its Learning Partner program into three tiers. At the top we have CLSP’s (Cisco Learning Solution Partners). The middle tier is where the CLP’s (Cisco Learning Partners) sit, and the bottom is where SO’s (Sponsored Organisations) sit. A CLSP is allowed to deliver only Cisco authorized materials using Certified Cisco System Instructors (CCSI). Having a certain number of certified staff members is a requirement. CLSP’s are allowed to customize courses but are required to report and pay royalties on all derivative works to Cisco. There are only a handfull of CLSP’s in the world and each has a specific region (or theatre) they look after. Its like a giant pyramid scheme with CLSP’s sitting at the top. CLP’s and SO’s must purchase kits (training manuals etc) from CLSP’s and get any derivative works approved. Cisco gets a cut from these derivative works. Now, here’s the real crazy part. The entire list of everything being offered in the Cisco 360 program, matches up, almost identically to what Netmaster is selling [note: was selling – NMC’s site now only lists the 360 program and a written program) – once again for about half the price for the package. It would appear that Cisco is “reselling” the Netmaster training programs and offering them for a 100% mark up. What’s so special about the Cisco 360 program? Nothing as far as I can tell. It’s just the Netmaster class program with the Cisco stamp on it. Someone must have switched Netmaster coolaid for the normal Cisco coolaid at the Raleigh, NC Cisco office. CCBootcamp – considering joining, but hasn’t formally applied or been accepted. Netmaster – wrote the program. Internetworkexpert – We are looking at it, but we don’t believe it’s the best option at this time. I tried to find out more about the “entrance fee” and I was told it would cost a training company around $30,000 to $45,000 per instructor between missed work (up to four weeks) and program fees. I am guessing that’s the reason the two currently Cisco authorized training companies, Unitek and CCBootcamp are having a hard time justifying the costs. If these companies join the program, and it fails, they just wasted $45k per instructor. 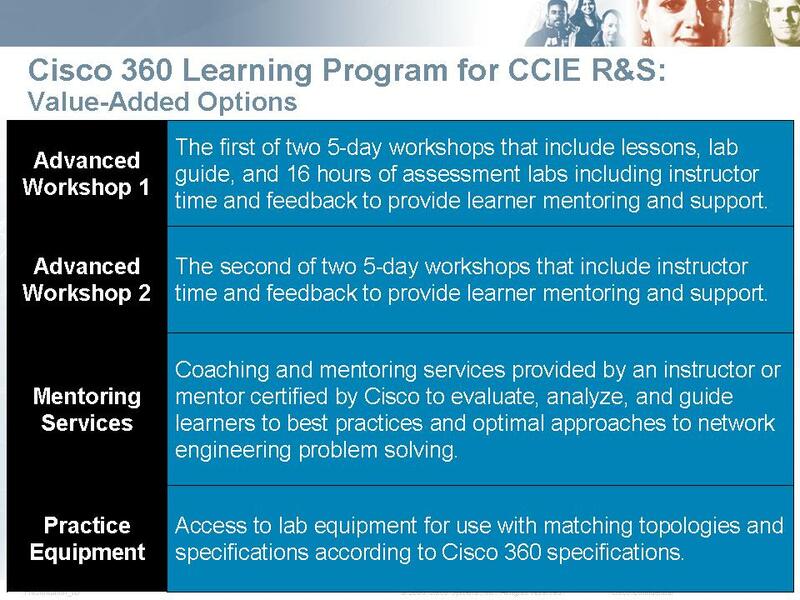 The Cisco Learning Network has a posting entitled “Top 10 questions answered about the NEW Cisco 360 Learning Program for CCIE Routing and Switching” which supports what CCIE Guru is saying. Assessment:Student takes a pre-assessment to benchmark their exposure to various networking topics. Planning: Based on diagnostic feedback students create a learning path that utilizes the breadth of the curriculum to obtain the necessary education and exposure. Learning: Students participate in lessons, read materials, and work with subject matter experts to gain understanding and knowledge in topics in which they need to develop competencies. Practice: Students then take the concepts learned and utilize practice exercises to gain exposure to real-world configurations by applying these topics in actual scenarios. Review: By utilizing the assessments students can then measure their understanding to validate their application and usage of the various approaches to solving network problems with the technologies. Mastery: By utilizing the reference material, answer keys, and best practices, students can then review their work product and hone their skills. Pre-Assessment:A four-hour diagnostic exam for networking core technologies. The pre-assessment serves as a benchmark for program preparedness necessary skills development. Workshops (classroom training): Two 5-day workshops that include instructor led lectures and feedback from instructors and peer to provide student mentoring and support. Library (reference documentation):Over 2,000 pages of searchable text and graphics offering advanced networking technical documentation and best practices for network engineers. On Demand Lessons (eLearning):Numerous hours of multiple topic-based lessons on topics such as IPv6, QoS, Frame Relay, Link Layer, and Networking Protocols. All recorded with experienced instructors with tips and tricks and indexed for convenient reference. Practice Lab Scenarios: (hands-on exposure) Over 250 hours of expert level advanced networking scenarios that enable students to implement network configurations in simulated real-world applications. Formative Assessments: (learning checks) a Series of timed, scenario based, mock lab performance tests that can be scored and graded to produce detailed feedback on skills and competencies. Mentoring: (Coaching) Detailed explanations of correct networking approaches and best practices that provide directed focused feedback in diagnosing errors, omissions, and sequencing in configurations. I’m a little surprised about the details of the eLearning portion of the training. There’s no mention of training for security, IP services, multicast, or system management. Maybe those topics are rolled into the training. If not, then a significant section of the blueprint is not represented. My guess (based on the observation that the announced eLearning modules match to the CODs that NMC used to offer) is that those topics are not addressed now, but (hopefully) will be once more content is developed/released. This bulletpoint really confuses/intigues me: “More than 400 hours of instruction, including 250 hours of practice”. Reading that I can’t understand if they mean “400 hours of instruction PLUS an additional 250 hours of practice” or “150 hours of instruction and 250 hours of practice”. Also, are they talking about the base package or the mac-daddy $$$ full-meal deal? Does “instruction” include reading the reference library? Without those answers I don’t know whether to be blown away (400 (10 weeks) hours of online training!!!) or underwhelmed (150 hours which includes 2 workshops, reading 2000 pages, and some mentoring time). I asked this question during the CCIE TV presentation but it was not answered. One of the big benifits of the new 360 program will be the Learning Management System (LMS) that will be used to track students’ progress. I fully expect to see IPexpert and Internetwork Expert roll out something similar. Both vendors already have proven end-to-end training that matches or exceeds what seems to be offered by the 360 program. While I can’t speak for IPexpert, I know that Internetwork Expert already has a lot of metrics that they could incorporate into an LMS in order to track and give feedback/direction on a candidate’s progress. Both companies could easily get a jump on the 360 program by implementing the LMS across all tracks (the 360 only covers Routing and Switching at this time). Anyhoo…this is most likely the last post I’ll be making about the new program. It’s not something that is a good fit for me but it looks like a very good choice for candiates who are not paying out of pocket. Even if I could afford to purchase the 360 program, I would definitely contact the vendor offering it to get more details about the amount of training included. The content should be pretty solid as NetMasterClass has a very good reputation. I don’t think that this will affect most of the big CCIE vendors as they can compete on prices as well as past success. The only real downside to the other CCIE vendors is if this means that they cannot train Cisco employees on Cisco campuses. I have to think that this is probably going to be the case. I can’t see Cisco rolling this program out and then not using it for their employees. That will probably mean a hit to the wallets of some vendors.